Parga is one of the prettiest towns in Greece, although it is on the mainland you can't help but believing that you are on one of the Greek islands. Parga is Situated in North-West Greece in the region of Epirus, just off the main highway towards the big port of Igoumenitsa. 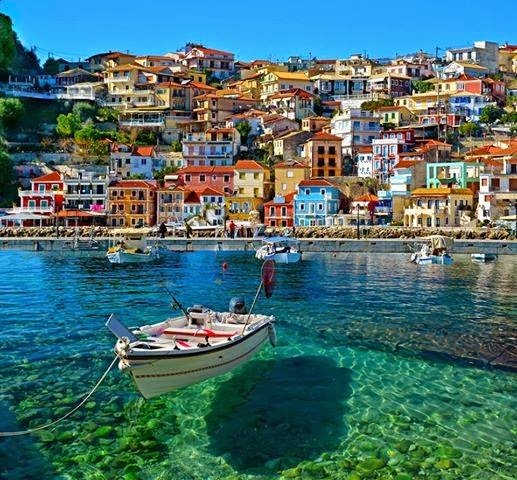 Parga seems to be hidden from the rest of the world by mountains and pine forests, but it is all worth while when you finally arrive at the town. Parga seems to curve around the harbour and cove perfectly while the town itself climbs up into the mountains in tiers making Parga seem like one huge Amphitheater. Through the summer Parga is geared for tourists, with tavernas, bars cafes, tourist shop, hotels etc but somehow has maintained that harbour town feel to it. Most tourists arrive at Parga from Preveza Airport (about one hours drive away) or from the port of Igoumanitsa, the main port to and from Italy and Corfu and so very popular with Italian tourists. Parga's coast line is almost fjiord like (as is most of Epirus) with the rocky deep coves and pine forests almost reaching the sea. It is the beaches in Parga that make the town so popular, there is one in the town itself next to the harbour. The water in Parga is crystal clear with rocky forested islands within swimming distance of the beach, one even has a white-washed painted church on it. The most popular beach in Parga is Valtos Beach which is on the other side of the cove from the town, this huge beach can be reached from Parga by a quick boat ride (a couple of minutes for a bit of money), or a walk up into the pine forests and round the cove. As well as the many fantastic beaches in Parga there are many more equally good beaches that can only be reached from the sea! Parga has been occupied by the Romans, Greeks, French, Turks, British, but none have left there mark as much as the Venetians. There biggest and most recognisable legacy is the huge castle fortress that over looks the town and harbour. The original castle was built in the 11th century by the Venetians to protect Parga from both pirates and Turks, and was rebuilt in the 13th century. The castle was occupied by the Turks in the 15th century and then retook by the Ventetians in the 16th century and rebuilt for the fourth time. Parga once again entering Turkish hands under Ali Pasha in 1813, when the whole town was sold to the Turks. Parga castleis very interesting to have a look around, on the main entrance you can see the emblem of the Lion of St Marks (Venice), but most of all the fantastic views of the town and harbour, most of the photos on this page were taken from the castle. Also there is a bar/cafe at the castle overlooking the town which makes the walk up through the winding streets of Parga to the castle even more worth while.